Here is a 12 question LSAT practice quiz with 4 questions from each section, and answers at the bottom (be sure to scroll down carefully!). 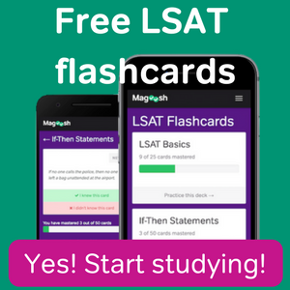 Keep reading for some free LSAT practice! Unlike Mercury and Mars, Venus has a dense, opaque atmosphere that prevents direct observation of its surface. For years, surface telescopes on Earth could glean no information about the surface of Venus. In 1989, the Magellan probe was launched to do a five-year radar-mapping of the entire surface of Venus. The data that emerged provided by far the most detailed map of the Venusian surface ever seen. The surface shows an unbelievable level of volcanic activity: over one hundred large shield volcanoes, many more than Earth has, and a solidified river of lava longer than the Nile. The entire surface is volcanically dead, with not a single active volcano. This surface is relatively young in planetary terms, about 300 million years old. The whole surface, planet-wide, is the same age: the even pattern of craters, randomly distributed across the surface, demonstrates this. To explain this puzzling surface, Turcotte suggested a radical model. The surface of Venus, for a period, is as it is now, a surface of uniform age with no active volcanism. While the surface is fixed, volcanic pressure builds up inside the planet. At a certain point, the pressure ruptures the surface, and the entire planet is re-coated in lava in a massive planet-wide outburst of volcanism. Having spent all this thermal energy in one gigantic outpouring, the surface cools and hardens, again producing the kind of surface we see today. Turcotte proposed that this cycle repeated several times in the past, and would still repeat in the future. To most planetary geologists, Turcotte’s model is a return to catastrophism. For two centuries, geologists of all kinds fought against the idea of catastrophic, planet-wide changes, such as the Biblical idea of Noah’s Flood. The triumph of gradualism was essential to the success of geology as a serious science. Indeed, all features of Earth’s geology and all features of other moons and planets in the Solar System, even those that are not volcanically active, are explained very well by current gradualist models. Planetary geologists question why all other objects would obey gradualist models, and only Venus would obey a catastrophic model. These geologists insist that the features of Venus must be able to be explained in terms of incremental changes continuously over a long period. Turcotte, expecting these objections, points out that no incremental process could result in a planet-wide surface all the same age. Furthermore, a slow process of continual change does not well explain why a planet with an astounding history of volcanic activity is now volcanically dead. Turcotte argues that only his catastrophic model adequately explains the extremes of the Venusian surface. (a) to provide proof for the most persuasive theory of planetary surfaces. (b) to explain a controversial scientific theory and the pattern of objections to it. (c) to trace the success of geology as a multidisciplinary science. (d) to demonstrate how different Venus is from every other geological entity in the solar system. (e) to evaluate Turcotte’s strengths as a researcher in his field. (a) make clear the historical basis of most objections to Turcotte’s model. (b) demonstrate what makes geology successful as a modern science. (c) discredit religious influences in modern science. (d) provide an example of a model based on incremental changes. (e) suggest that the surface of Earth is older than the surface of Venus. (a) provide substantial support for Turcotte’s model. (b) suggest systematic flaws in the data provided by the Magellan probe. (c) call into question geologist’s understanding of how volcanoes develop. (d) argue for the presence of several incremental changes over time. (e) present a seemingly incongruous set of scientific observations. 4. The passage implies which of the following about volcanoes on Mars? (a) many of them remain active to the present day. (b) the lava from these volcanoes would rarely flow in long rivers. (c) different volcanoes, active at different times, slowly transformed the surface. (d) most of them were not impacted by craters. (e) they typically did not release a large amount of thermal energy at once. An airplane manufacturer is determining how many seats to install in each of seven new airplane models–the Aztec, the Bermuda, the Calypso, the Drake, the Formosa, the Guadeloupe, and the Havana. The Bermuda, Calypso, and Guadeloupe are designed for long-distance travel while the Aztec, Drake, Formosa, and Havana are designed for short flights. Each model will be outfitted with either 50, 150, or 250 seats, according to the following guidelines. No long distance plane will have 50 seats. All fuel efficient planes are outfitted with more seats than planes that are not fuel efficient but are designed to travel the same distances. The Aztec, the Calypso, and the Formosa are the only fuel efficient planes. 5. If the Aztec is not outfitted with the same number of seats as the Formosa, which of the following could be true? (a) The Aztec is outfitted with 50 seats. (b) The Drake is outfitted with 150 seats. (c) The Havana is outfitted with 150 seats. (d) The Aztec is outfitted with the same number of seats as the Calypso. (e) The Bermuda is outfitted with the same number of seats as the Drake. 6. If only one plane is outfitted with 50 seats, which one of the following must be true? (a) The Drake is outfitted with 150 seats. (b) The Aztec is outfitted with more seats than the Bermuda. (c) The Bermuda is outfitted with more seats than the Drake. (d) The Guadeloupe is outfitted with more seats than the Havana. (e) The Havana is outfitted with the same number of seats as the Bermuda. 7. Which one of the following must be true? (a) At least one plane is outfitted with 50 seats. (b) At least two planes are outfitted with 250 seats. (c) No more than three planes are outfitted with 150 seats. (d) At most two planes are outfitted with 50 seats. (e) If the Aztec is outfitted with 250 seats, the Havana is outfitted with 50 seats. 8. If exactly two of the planes are outfitted with 250 seats, which one of the following must be true? (a) Both the Drake and the Havana are outfitted with 50 seats. (b) Exactly two planes are outfitted with 150 seats. (c) The Bermuda is outfitted with 50 seats. (d) The Formosa is outfitted with 250 seats. (e) The Havana is outfitted with 150 seats. 9. Chuck: A 15 year old recently won a large grant to fund his fledgling cookie company by receiving more votes than hundreds of other startups, many of which were founded by seasoned entrepreneurs. However, he collected his many votes with little to no advertising budget, instead relying on a complex and unusually dedicated network of social connections through school, sports teams, family, and neighbors. Therefore, his victory is an anomaly. Samantha: If a marketing plan can be replicated successfully by other businesses, then it’s a valid strategy regardless of whether it utilizes traditional methods of advertising. Thus, if other teenagers are able to use similar social networks to increase awareness and gather support for their small businesses, this victory is not an anomaly. (a) whether a marketing plan must be replicated by other businesses before it can be considered a valid strategy. (b) the efficiency and effectiveness of traditional advertising strategies compared to the one used by the grant winner. (c) how to assess the validity of a nontraditional marketing strategy. (d) whether a marketing strategy that has not yet been replicated by any other business is an anomaly. (e) the extent to which the 15 year old’s marketing strategy is different from traditional marketing strategies. 10. CopyHaus hired a consultant to explore how to optimize its customer satisfaction ratings. The consultant noticed that customer satisfaction ratings were at their lowest on days when the company’s high capacity color copier was under maintenance. The company’s directors thus determined that the consultant’s observations were adequate to ensure stockholders that customer satisfaction ratings would remain high as long as the color copier was operable. The CopyHaus directors’ argument is most vulnerable to criticism on which one of the following grounds? (a) It assesses the general utility of all consultants based on a single experience. (b) It assumes that the consultant accurately evaluated the impact of the color copier on customer satisfaction ratings. (c) It bases an opinion about the overall value of a business consultant’s findings on one observation that could have been made without professional assistance. (d) It presumes without justification that historically coinciding events were and will continue to be causally related. (e) It guarantees a result based on the presence of a condition, the absence of which guarantees the opposite result. 11. Cities with modern international airports attract multinational corporations and large numbers of tourists, and thus have strong economies. Therefore, cities without modern international airports are unlikely to flourish economically. The flawed reasoning in which one of the following is most similar to that in the argument above? (a) In order to pass his history exam, Timothy must memorize most of the facts in his study guide. Thus, if studying for his math exam prevents him for memorizing most of the facts in his study guide, Timothy probably will not pass his history exam. (b) Baking a pizza in a wood-fired oven is an easy way to guarantee a thin, crispy crust because of the high temperatures inside the oven. Baking a pizza in a conventional oven that does not reach temperatures as high as a wood-fired oven, therefore, is unlikely to result in a crispy crust. (c) Those who are tactful negotiators are frequently placed in important sales positions within companies because such a skillset improves a company’s profits. Thus, the ability to improve a company’s profits is a key characteristic of anyone in an important sales position. (d) Dog trainers use treats to teach dogs how to respond to commands because treats help the dog connect a desirable behavior to an immediate, desired outcome. Without treats, it would be extremely time consuming to teach a dog that certain behaviors resulted in more desirable long-term conditions. (e) If you prefer tart blueberries over sweet blueberries, then you should pick them from your plant when they are still reddish purple in color. Thus, if you see someone picking reddish purple blueberries from his or her plant, then you can assume that person prefers tart blueberries. 12. Professor: Given the statement that any individual who is a member of one particular group could also be a member of a second group, we cannot conclude that any member of the second group could also be a member of the first. For example, it is fallacious to argue that because any child could be a future politician, any future politician could be a child. This is because at any given time there are presumably many adults who are future politicians. (a) Anyone born in the United States can be appointed to the Supreme Court, so it must be true that anyone appointed to the Supreme Court was born in the United States. (b) Each member of the class can apply for a scholarship to the local arts academy’s summer program. Therefore, there is a chance that any one member of the class will receive the scholarship. (c) Any dog could be a family pet, so it follows that any family pet could be a dog. (d) If a person has ten raffle tickets and any one of them could be drawn for a prize, then each one of those tickets has a one in ten chance of being the prize-winning ticket. (e) Over ten thousand people were registered to vote in a municipal election, so it follows that at least ten thousand people were residents of that municipality. 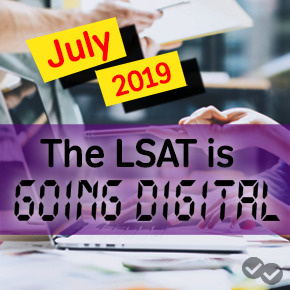 Released LSAT Tests: Which Ones are Public?